The Retreat Center has two dormitory type rooms on the upper level each sleeping 16 people in bunk beds. There is also a full kitchen and meeting room on the upper level. New restrooms with showers are located in the lower level, as well as a living area and another dormitory room for 12 people. There is a sand volleyball court near the Retreat Center as well as a fire pit with benches. We do not prepare meals for you in this building, but you can prepare your own in the kitchen. 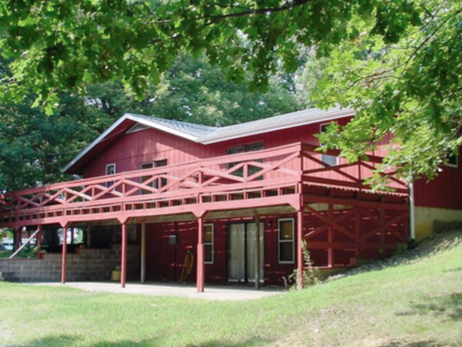 The Retreat Center is available for overnight retreats, as well as day use for meetings. Click here to download a Camp Retreat Brochure PDF.